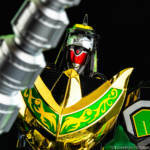 The recently revealed Soul of Chogokin Dragon Caesar, or as fans of Mighty Morphin Power Rangers may know it as the Dragonzord, is now available for pre-order at our site sponsor BigBadToyStore.com! You can pre-order the Soul of Chogokin Dragon Caesar by clicking here! 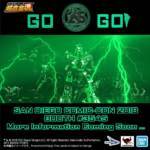 The Soul of Chogokin Dragon Caesar is scheduled for release at BigBadToyStore.com in August of 2018 and is currently available for $174.99. Don’t forget to use the “Pile of Loot” shipping method to combine it with your other orders and save tons of cash! 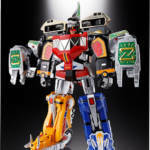 The Soul of Chogokin Dragon Caesar will combine with the Soul of Chogokin Daizyujin (MMPR Megazord). The Soul of Chogokin line is considered a “masterpiece level quality” robot, with recent releases doubling or tripling their value after production. Don’t miss this chance to own the definitive version of the Dragonzord! The month of July cannot get here quick enough for some of us Mighty Morphin Power Rangers and Kyoryu Sentai Zyuranger fans. Tamashii Nations recently revealed the release information for the upcoming Soul of Chogokin Dragon Caesar (July 2018 for 17,280 yen). For fans of the Mighty Morphin Power Rangers, Dragon Caesar is the Japanese name for the Dragonzord. This beautiful collectable is able to combine with the previously released Soul of Chogokin Daizyujin (Mighty Morpin Power Rangers’ Megazord). Does this mean in 2019 we’ll see God King Brachion (Titanus)? Only time will tell. The Soul of Chogokin page for SOC Daizyujin has been updated with all the information for Dragon Caesar, including design schematics. It is quite a marvel to see how this thing was designed. We’ve mirrored the images here and you can see them all by clicking the title of the story. You can see the product page itself by clicking here. We won’t even ask if you’re going to buy this. Of course you are. So instead of sounding off on whether or not you’ll buy it, let’s sound off on how we’re going to display this thing and in what mode!